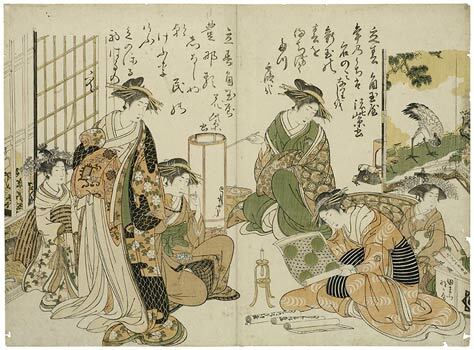 Double page 3 from the book “New Beauties of Yoshiwara in the Mirror of their Handwriting” In an establishment in Yoshiwara the “courtesan” (keisei) Koimurasaki’s shinzō is unpacking a roll of brocade, presumably a New Year’s gift from an admirer; other rolls of cloth are in front of her; behind them is a crate from Tamara Nakaya. A handwritten spring poem by Koimurasaki is above the figures. On the left, under a waka in her own calligraphy, is the “courtesan” Hanamurasaki in festive attire. Kitao Masanobu was born in Edo in 1761. At the age of 15 or 16 he became a pupil of Kitao Shigemasa, and shortly afterwards began illustrating the novelettes knows as kibyōshi. In 1778, Masanobu published his own first novelettes, and in 1982 took the literary name by which he is best remembered today, Santō Kyōden. This set, which seems to have been designed and published around the time Masanobu adopted his new pseudonym, is considered to be one of his masterpieces. But much of the credit for the excellence of the prints, their large luxurious format, their exquisite engraving and their subtle printing must go to the publisher of the set, Tsutaya Jūsaburō. Tsutaya began his career in the 1770s as a modest publisher of novelettes and illustrated guidebooks to the Yoshiwara. In 1776 he was financially involved in the publication of Seirō Bijin Awase Sugata Kagami, a three volume book with illustrations of courtesans seen in the course of their daily life in their private quarters in the Yoshiwara by Shunshō(?) and Shigemasa. The success of this book was probably in his mind when, around 1782, he commissioned Masanobu to design a series of prints on a similar theme. At this time, Masanobu was in his early twenties. Tsutaya had just turned thirty, and obviously intended to place himself in one giant step at the centre of the stage of ukiyo-e publications. His rival at this time was Nishimura Eijudō who was publishing ôban of courtesans by Koryūsai. Tsutaya decided to publish his prints in double ôban format, the first time this format had been used. The prints were immediately successful. In 1783, Tsutaya was able to assume the franchise of Maruya Kohei, an important publisher of two-colour prints in the 1750s, and one of his first undertakings, after moving his shop from outside the gate of the Yoshiwara, to the book and print publisher’s district in Toriabura-chō, was to reissue the seven plates by Masanobu in album format. The album appeared in 1784, with a preface by the poet Yomo Magao, and a post face by another poet, Shūrakukan Shūjin. Most surviving impressions of prints from the series are from this second edition, with conspicuous centrefolds, as here. The album ostensibly served to display examples of calligraphy by celebrated courtesans, and the difference in women’s hands. Both poems are conventional effusions on the coming of spring. Reproduced in: Ingelheim catalogue, no. 47.